NETBALL is taking off in Shiplake with the launch of a new club. Shiplake Stars was set up by Juliette Coles and Tamryn Lawrence to make the sport more accessible to girls in the area. 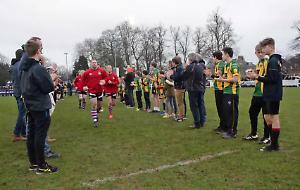 Training sessions are held every Sunday morning at Shiplake College, where Miss Lawrence has coached the sixth-form team for the last two years and her 16-year-old son Jacob Kirby is a pupil. The club also holds walking netball sessions, a less physical form of the sport, for women on Tuesdays at Shiplake Memorial Hall and an after-school club at Shiplake Primary School. Miss Lawrence, 42, a writer from Sonning Common, said: “We have about 30 girls that come down on Sundays. We started a year ago when Juliette realised there was no netball for girls around the Henley area. She got in touch with the college and asked if she would be able to use the court. The women started the walking netball group in January. Miss Lawrence said: “It’s a slowed-down version of the game that’s suited to women coming back from injury or illness. “About 15 ladies come along and there is a range of ages. It’s just a really nice, friendly setting and not super-competitive.